Whoever said there's a "right way" to scrapbook? I remember my mom use to cut, paste, stamp, and even paint in her family scrapbooks. And now, we're even luckier to have digital scrapbooks to make the process accessible in the modern age. 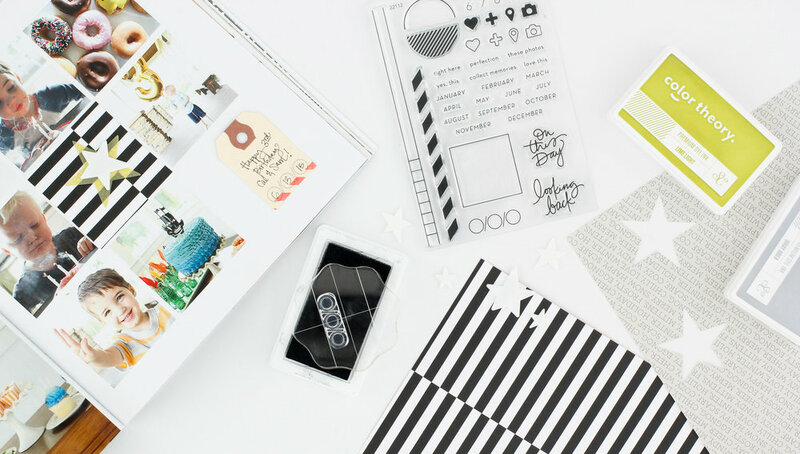 Whether you're a hands-on scrapbooker or a digital scrapbooker, Mixbook and our paper craft partner Studio Calico are here to show you a brilliant way to combine these two hobbies! This month, Studio Calico and its founder April Foster are putting on a Mixbook photo book workshop, where you'll learn how to not only create a stunning photo book on Mixbook.com, but how to further customize your book with traditional scrapbooking techniques. Here at Mixbook, we're always advocating customization of our products. It's truly the best way to make something yours from front cover to cover. This month Studio Calico designed a photo book just for Mixbook! The new Modern Year in Review photo book features clean, minimalist elements that leave plenty of room for further embellishment. April's workshop will show you how to create your own Modern Year in Review photo book to make the most out of our editor. April's Mixbook workshop was created with an exclusive expanded size photo book holding 37 pages! If you're interested in the expanded version just click "Copy" and start your book from our custom template here. After you create and receive your photo book, April will walk you through all the fun, handmade extras you can add to your creation! Ever had the idea to add a pocket to your book? You could collect and save all your memorable ticket stubs, class photos, or physical keepsakes from the year right inside the back cover of your photo book. Join April Foster and Studio Calico to explore a unique take on how to create your own Mixbook. This is one workshop you'll love to learn from! Mixbook users also receive a VIP discount on her workshops. Use code MIXBOOK30 for 30% off April’s Mixbook Workshop; expires Feb. 29 at 11:59 p.m. EST. Purchase here. Use code MINIBOOK20 for 20% off Studio Calico's entire 2016 Mini Book Mini Workshop Bundle. Learn how to craft art journals, calendars, notebooks, and more all year-long; expires, March 31 at 11:59 p.m. EST. Purchase here.